Hello, friends! Today, I have a quick DIY for you based on some lovely photos I’ve been seeing all over my Instagram feed. You may or may not know that I have a slight love affair with kraft paper. It’s great for wrapping presents and covering tables and as packing paper for items I ship. One thing I never thought I’d do with it, though, was decorate with it. That all changed when I saw this photo from Nelly Friedel on Instagram. There are a few Etsy sellers who sell signs similar to this of course. Being me, though, I wanted to try my hand at making my own. Before we jump in to the tutorial, let me amend this post by saying that this is a simple DIY. It doesn’t require any building — just some hot glue and handwriting. Anyone can do this! 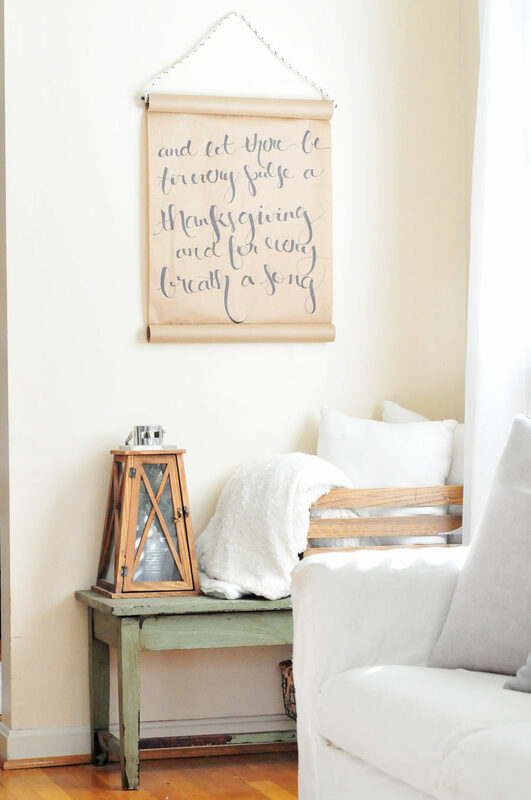 I will say that I’d like to make one with a rolling bar so that I can rewrite on it anytime similar to this one that Joanna Gaines did for Fixer Upper. That’s a DIY for another day, though, because it requires some hefty brackets and iron. So for now, here’s the simple version! 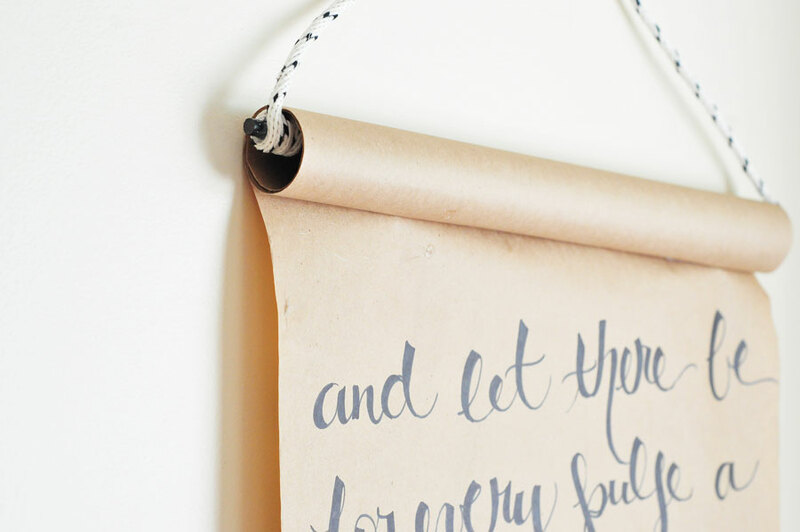 All you’ll need for this project is a small roll of kraft paper (I used packing paper that’s a little under two feet wide), hot glue, a dowel rod, some oil-rubbed bronze spray paint, some twine or rope and a sharpie. 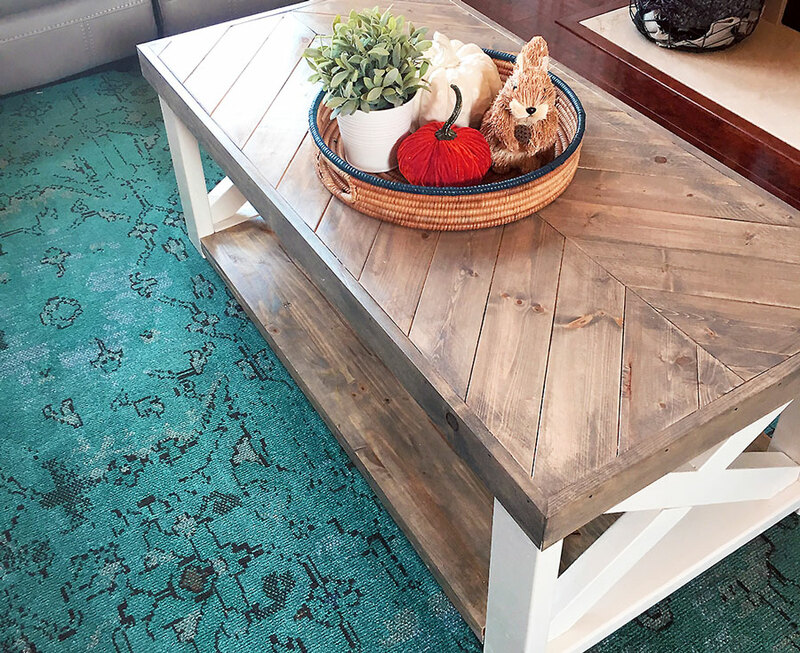 I actually had all of these things on hand, so this project was a complete freebie! 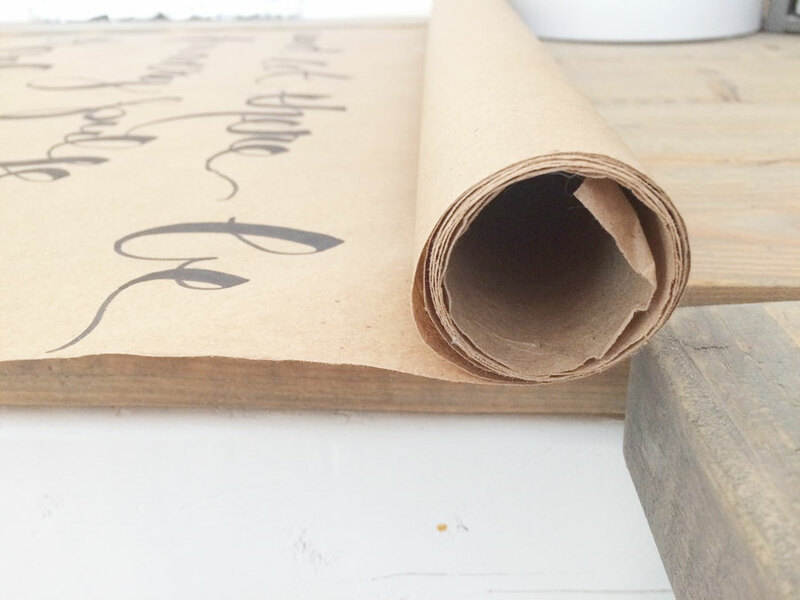 To start, cut your dowel rod down to 2″ wider than your kraft paper roll. Mine ended up being cut at 23″. I wanted a small part of the rod to stick out on either side of the paper when it was hung. I used a miter saw to cut mine, but a hand saw will work just as well, or have the nice people at the hardware store do it for you. Once that’s cut, spray paint it with the oil rubbed bronze spray paint. I used Rustoleum because it’s my favorite for coverage and durability (no, we are not receiving any compensation from Rustoleum for this post. It’s just our opinion). While that dried, I went inside to cut my kraft paper down to size. I measured out a 7 foot long piece of kraft paper for this project. Once it was cut, I found approximately the middle and wrote out the phrase I wanted on my sign. You can choose anything! Here’s a hand-lettering tutorial we did about a year ago and another one from earlier this year that you can use as a guide. I cheated on this one and simply wrote it out in cursive and then went back with my sharpie and highlighted all of the downstrokes with a thicker line. It looks like calligraphy but took a fraction of the time. Once your phrase is written out, roll up the top and the bottom of the paper and glue it in place. 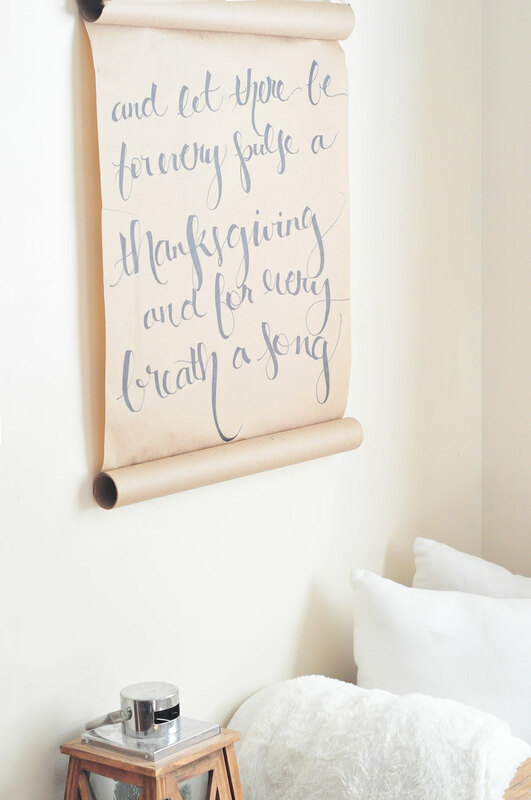 Hint: glue a few long lines as you roll to keep the paper from unrolling instead of one line at the end. That’s it for the scroll part. Now back to that dowel rod. 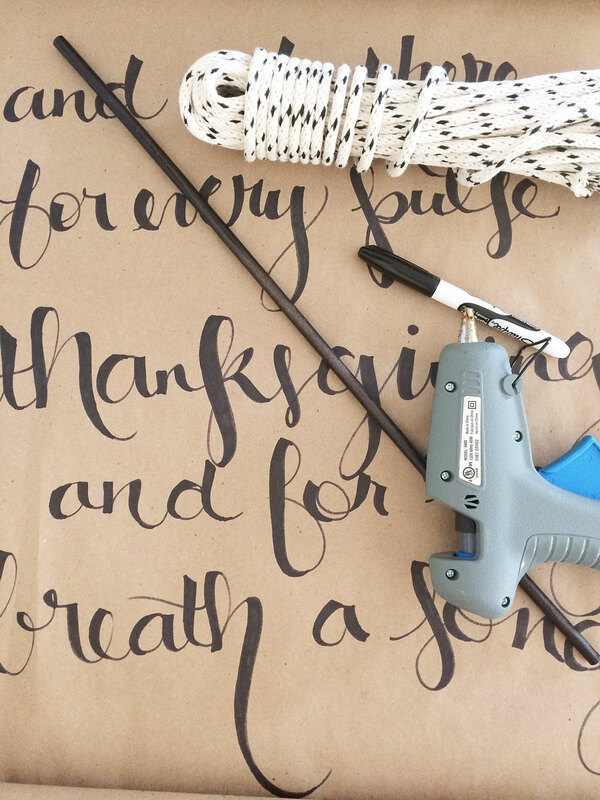 You’ll need the dowel rod, hot glue and the rope or twine you chose. I used this really thick rope that I had originally purchased for the hanging tables on our porch. Having hung the sign, I don’t actually love that rope because the sign isn’t heavy enough to weigh it down and straighten the sides of the rope, so I’d go with something a little thinner. If you still want white or lighter colored rope/twine, they have dyed versions at Walmart and Hobby Lobby stores that you can use. Of course, you can always go natural and use twine which they sell pretty much everywhere! 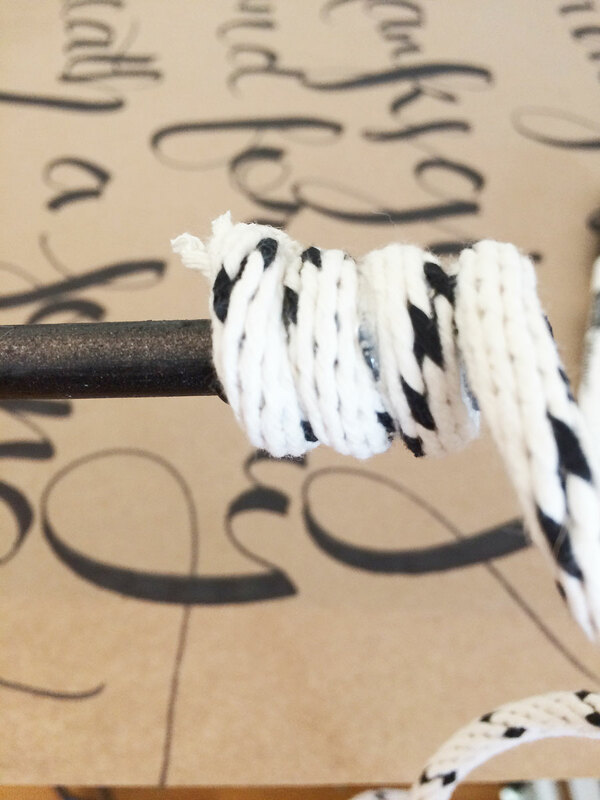 Hot glue the rope to one side of your dowel rod wrapping the rope around the rod starting about an inch in and working toward the outside. Hold it until it has dried. Then thread the rod through the kraft paper roll and do the same thing on the other side of the dowel rod. I let that sit for a few minutes to make sure it was completely dry and then just hung it on a nail in our living room. That’s it, friends. A really simple DIY, but it packs a punch! 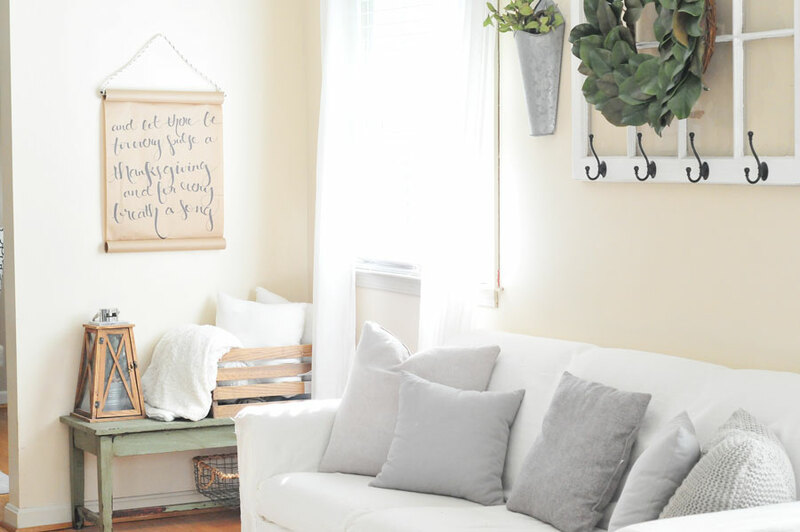 It’s completely customizable, too, so make it larger or smaller depending on the space you’re filling, and it’s easy enough that you can slip on a new roll when you want to change out the phrase! We’d love to see yours if you make one! Tag us (@saltandlifeblog) on Instagram, Twitter, Facebook or Pinterest for a chance to be featured on one of our accounts. Hope you have a wonderful Monday, friends!!! How did you keep the bottom of the scroll from rolling up? Did you put something at the bottom to keep it weighted? Hi, Jessika! Thanks for your comment. I didn’t have to put anything on the bottom because gluing the bottom part of the “scroll” added enough weight. However, I have seen people use magnets or even coins taped to the back to keep them from rolling up! 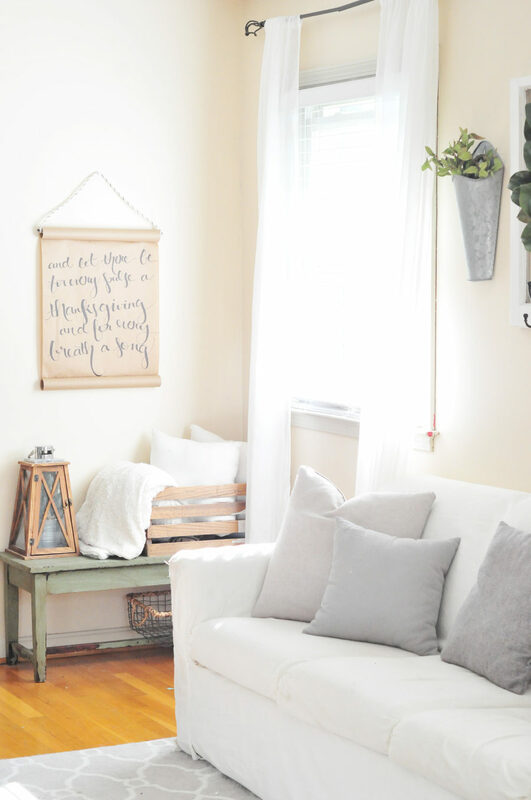 I wanted to DIY a scroll after seeing inspo on Instagram and decided to Google before I started to see if anyone had DIYed this and had some tips. So glad I found your post! I made a sign to put over my coffee station. Thanks for sharing this! YAY!!! That’s awesome! Coffee station deserve THE BEST signs!